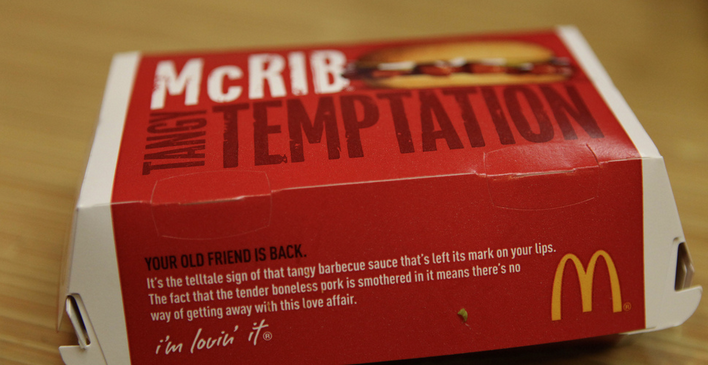 Last November, the McRib returned in all its glory to nearly three-quarters of McDonald’s U.S. locations. This year, however, the (real) meat patty with (fake) ribs will be a bit harder to find, as many franchisees have decided to forgo the limited-time item. The Golden Arches has once again left it up to local franchise groups to decide whether or not their menu will include the McRib this fall, and as it turns out, many won’t, CNBC reports. While in the past McDonald’s has put the McRib on the national menu, in recent years the chain used the item as a regional option to boost sales in the latter part of the year. CNBC reports that in all, just 55% or about 8,000 — of the company’s 14,350 restaurants will carry the McRib this year with some areas of the U.S. have already started handing out the barbecue covered sandwich. The introduction of limited-time offerings from the Golden Arches has increased in the last year as part of the company’s strategy to turn around consistently sluggish sales by keeping customers interested in the fast food fare.